Did you know that 76% of travellers post vacation photos to social media networks while on vacation? This figure is shocking, right? However, it is acceptable for most people. As we all know, with the advancement of social media, travellers now are sharing their travel experiences online more often than never. This phenomenon has influenced the way how hoteliers and homestay owners shall market their businesses. A more creative and successful marketing strategy has discovered by businesses, which is the User-Generated Content (UGC). In this blog post, we will explain what UGC is and why it is so important to hoteliers and homestay owners. 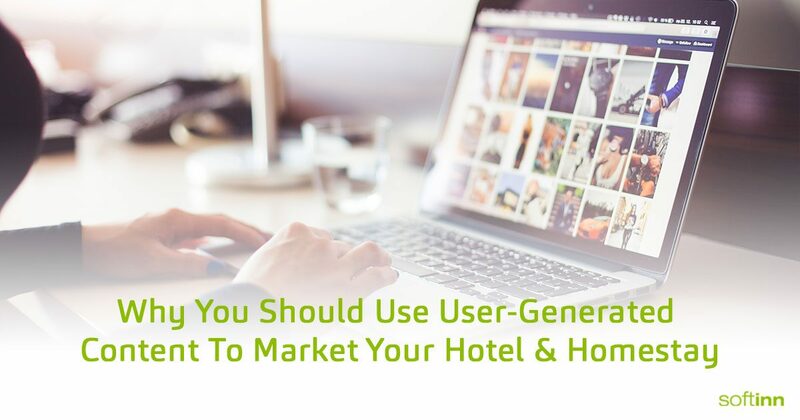 Read ahead to understand how UGC can drive your hotel and homestay bookings. What is User-Generated Content (UGC)? User-Generated Content (UGC) is a powerful tactic that can take your social media content strategy to the next level. It is known as any type of contents about your hotel or homestay that is created by your guests, which includes discussion forums, reviews, social media posts, tweets, podcast, videos etc. In short, turning your guests’ photos, videos, reviews or social posts into valuable marketing assets to promote your hotel and homestay. Why Should Hoteliers and Homestay Owners Harness UGC? Yes, driving direct bookings is the biggest reason why hoteliers and homestay owners should implement UGC. As a matter of fact, harnessing the power of UGC, getting your guests involved in the content creation process will lift engagement, strengthen your guests’ trust and ultimately drive sales. We will discuss below in details how these factors can influence your prospects buying decisions and eventually turning them into your guests. When your guests share their travel experiences online, it creates opportunities for your hotel and homestay to authentically connect with them, getting them more likely to talk or write about your hotel and homestay. This will not only result in higher conversation rate but also create engaging site-based experiences, thus, increase the likelihood of them visit your hotel and homestay again in the future. In general, people use UGC as part of the buying experience to help them make purchasing decisions. In this sense, your guests are the most powerful social influencers to promote your services for you because people tend to trust their peers’ advice and recommendations more than they would trust advertisements. Those authentic contents created by your guests will not only save your time but also add social proof to drive higher engagement and eventually leads to more bookings. According to a survey, 85% of consumers find UGC more influential than brand-created contents. With UGC, you would have more people talking about your hotel and homestay. User blog posts, social media posts or any external reviews can help you get exposed to more prospects that would otherwise not know about your hotel and homestay, creating brand awareness to the public. Those contents that are created by your guests are in fact, one of your intangible assets to understand what are the perceptions of your guests. By monitoring your social media page for comments and posts, you can know how your guests think about your hotel and homestay. You can be advantageous if you gather the information, make use of them to improve your service and tailor-fit your products to different types of guests, ultimately drive sales. Are you deciding to harness UGC but could not know how to start at the beginning? Click here to check out the valuable tips on how to encourage UGC for your homestay and hotel.